"Yin" and "Yang" are two opposing energies, dark and light. 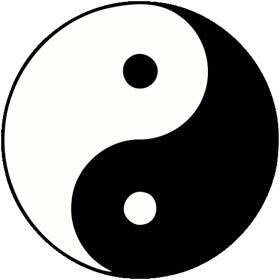 The rule of "Yin" and "Yang" means the interaction of two opposing principles. All that bel ongs to the weakened energy, belongs to the "Yin"-feminine principle, and all, what belongs to the strong energy - is "Yang" - masculine. What are these two principles? This would be some sort of connection in the world of the opposite qualities. "Yin" and "Yang" are complementary, and out of their interaction there is composed all possible harmony in the world. Here's a simple example: the day ("Yang") is always followed by the night ("Yin"), after the cold in winter ("Yin") always comes the hot summer ("Yang"), in the heat ("Yang") we always want to find a cool place ("Yin"), etc. One energy is complementing the other, this two energies should be emerging from each other. The energy is not disappearing or moving anywhere, it just smoothly flows from one kind to another. "Yin" and "Yang" - are the Moon and the Sun, day and night, water and fire, cold and heat, earth and heaven, body and spirit. All that is dark, heavy, shaped, passive and cold has the nature of "Yin", all what is formless, light, strong and bright has the "Yang" nature. "Yin" and "Yang" are interacting with each other, and this interaction is manifested in five elements of the universe. These are the fundamental energies of the universe, where everything is made of these elements, including the destiny of any given person. There is a belief in China that the more respectable is a man and the better people speak about him, the faster he will become successful in life. And the one, who achieved a great success - lives an active life full of abundance and pleasures, which means, that he is living a "Yang" life. Thanks to the Feng Shui, we can all achieve a "Yang" life-style, but remember, you can not completely banish the "Yin" energy at your home! Everything should be balanced, which means, that everything should reach the equilibrium. "Yin" and "Yang" are one and the destruction of one energy is leading to the disintegration of the other. We should not forget about harmony. Furnishing our own house and designing the interior in the style of "Yang", we must necessarily introduce also the element of "Yin" to keep the balance. When the amount of "Yin" and "Yang" is balanced, all dwellers of the house will be able to show an amazing strength of character and ability to compromise where it is necessary. Nothing will prevail: neither gaiety, nor apathy, behavior will be perfectly balanced. In turn, this balance leads to the great success in life. Thus, the dwellers of the house will get the opportunity to succeed because of harmony. It should be noted that the interaction of "Yin" and "Yang" may often go unnoticed by people.